JetBlue Airways continues to exude confidence that its higher than average capacity expansion in 2015 is being executed profitably, arguing that its favourable experience with competitive pricing is a combination that few airlines are looking to exploit. The airline faces the delicate balance of increasing shareholder returns and still maintaining a positive customer image, something that was dulled in late 2014 as it unveiled a seat densification and new fare families whose lowest priced option includes a first bag fee. Now that some of the competitive capacity JetBlue faced in the Caribbean and Latin America in late 2014 has eased, the airline’s overall network diversification should create some advantages for the airline in 2015 as it works to deliver higher returns and strengthen its balance sheet. Although JetBlue has revised 1Q2015 capacity guidance to 9% to 10% from 11% to 13% due to winter storms, its supply expansion for 1Q and its planned 7% to 9% growth for 2015 are higher than capacity projections by most airlines (with the exception of fellow hybrid airline Alaska, which plans 8% growth in 2015). JetBlue constantly faces questions about its growth targets, and what triggers would cause the airline re-evaluate its capacity expansion. During a recent investor conference new CEO Robin Hayes explained that overall JetBlue is delivering profitable growth. Offering the transcontinental market as an example, Mr Hayes stated that in the summer of 2015 JetBlue’s daily flights from its New York JFK to Los Angeles will grow to eight from roughly three-to-four a year ago. Its flights from JFK to San Francisco are growing to five from two-to-three. Those are also markets where JetBlue features its Mint premium product that debuted in 2H2014. Mr Hayes remarked that the Los Angeles and San Francisco are generating significant profits even with the rise in capacity. He also pointed to JetBlue’s Fort Lauderdale focus city, was one of the top performer’s in the airline’s system in 2014, and one of the airline’s fastest growing markets. Fort Lauderdale is presently (6-Apr-2015 to 12-Apr-2015) JetBlue’s third largest base measured by seats. JetBlue recorded 3% growth in passenger unit revenues for both Jan-2015 and Feb-2015, but 2ppt of Jan’s increase and 2.5ppt of Feb’s rise were attributable to positive effects from winter storm Juno that occurred in early 2015. The positive effects from the storms are likely driving a projected 3% to 4% rise in JetBlue’s passenger unit revenues in 1Q2015. Most of the industry is guiding to flat or decreasing unit revenue growth for the quarter. Delta Air Lines recently forecast a 1.5% decline in consolidated passenger revenues for 1Q2014, driven by the strengthening USD against other currencies. The airline also stated that domestic strength in Mar-2015 did not materalise to levels that the airline expected. Obviously JetBlue’s network footprint is vastly different from Delta. The bulk of JetBlue’s international capacity is deployed into the Caribbean, a region that garners a larger portion of inelastic, VFR demand. 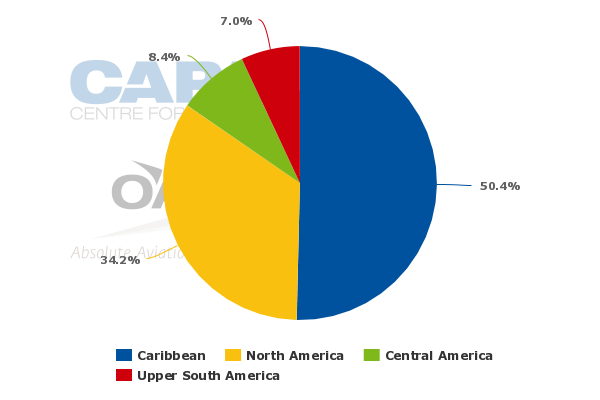 At the beginning of 2015, JetBlue remarked that capacity growth in the Caribbean and Latin America that pressured its yields during 3Q2014 had waned, and anticipates that 30% of its capacity will be deployed to those regions in 2015. The airline is launching new twice weekly service from JFK to Grenada in Jun-2015 (competing with Caribbean Airlines), and also deploying Mint-outfitted aircraft on existing service from JFK to Aruba and Barbados in Nov-2015. It is operating one weekly Mint flight to each destination, with additional service planned during the Dec-2015 holiday season. It is an interesting move for JetBlue as a market like Boston seems like a more predictable area to expand Mint. But JetBlue executives told The New York Times in 1Q2015 that those markets have high-end premium leisure demand. With such a small number of flights, it could be a sound, low risk experiment by JetBlue to determine how Mint would perform on international routes. Will changes to shore up revenue hurt JetBlue’s favourable customer sentiments? The coach class seats in JetBlue’s larger gauge A321s (the Mint aircraft feature 159 seats and the non-Mint jets are equipped with 190 seats) feature 33in of pitch, roughly 1in less than the 34in available on the airline’s A320 aircraft. CAPA’s fleet database shows JetBlue presently has 15 A321s in service and 31 remaining on order. In late 2014 JetBlue outlined plans to add 15 seats to its 150-seat A320s. Those plans, along with the anticipated 2015 debut of new fare families whose cheapest tier does not include a free checked bag, created some consumer backlash. But Mr Hayes explained that customer surveys are rating the economy product on the A321 higher than the A320. 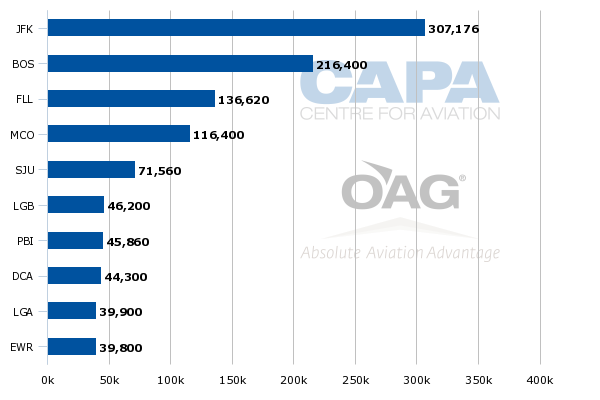 Even as the seat pitch lessens, the 33in featured on the A321s and the re-configured A320s is still among the most generous in the US industry. The aircraft reconfigurations on JetBlue’s A320s are scheduled for completion in 2016. Those changes, while unsavory with some passengers, are necessary for JetBlue to grow its revenue during the next few years to lift profit margins. The airline anticipates that the fare families, cabin refresh and other initiatives should create approximately USD450 million in annual operating revenue beginning in 2017. Overall JetBlue still provides a value experience for a reasonable price. But as the bag fees are ushered in and the denser aircraft are incorporated into its fleet, it will be interesting to watch how the airline fares in consumer satisfaction surveys. After missing ROIC targets in 2013 and 2014, JetBlue is focussed on shoring up returns in 2015 and delivering a 10% ROIC by 2017. As previously reported by CAPA that lags behind most US airlines, but JetBlue is working from a lower return base – 5.3% in 2013 and less than 7% in 2014. It is also likely that JetBlue could be offering conservative return estimates as to ensure it fully meets its stated goals for investors that are looking for progress in that metric. JetBlue has also deferred 16 Airbus deliveries from 2016 to 2018 to 2022 to 2023, which will cut capital expenditures by USD900 million through 2018. Similar to other US airlines, JetBlue is also in a process of de-levering. It net debt to EBITAR ratio dropped from 4x at YE2011 to 2.8x at the end of 3Q2014. Mr Hayes stressed that JetBlue’s focus in 2015 was shoring up returns and continuing its de-levering. But it appears some investors are angling for JetBlue to define its plans once its meets is return goals and balance sheet targets. Mr Hayes stated that different companies are at different stages in their evolution, and while JetBlue has thought about the next phases after it meets ROIC targets and pares down debt, those tasks remain the airline’s focus for the time being. It is a reasonable assessment, but as 2015 progresses it is likely that investors will grow louder in their request over clarity of when JetBlue could formulate some type of shareholder reward package. Although JetBlue is certainly at a different point in its evolution from some of its peers, nearly every publicly traded US airline is touting their rewards. At some point in the near future JetBlue will need to formulate its own plan to reward its owners.